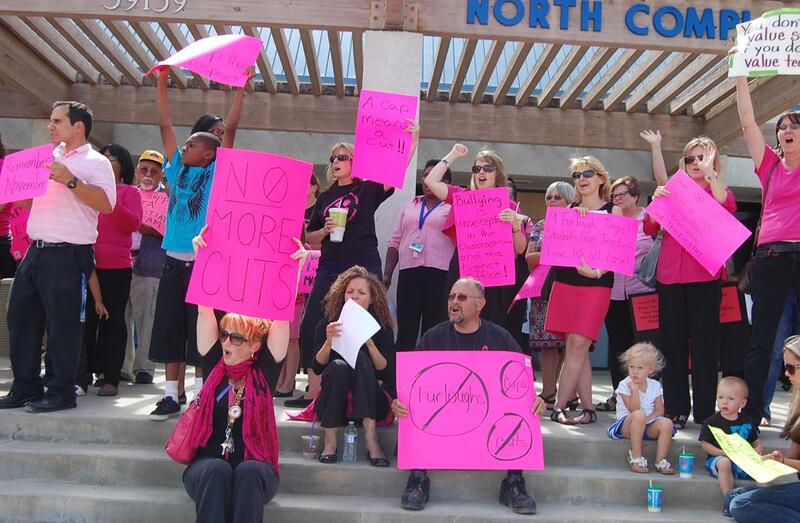 Classified employees voted on June 13 to accept a tentative agreement; however, The Palmdale Elementary Teachers Association (shown protesting at the Palmdale School District on May 21) has not agreed to the same salary reductions, furlough days and maximum contribution and is currently in factfinding. PALMDALE – The California School Employees Association (CSEA) Local Chapter 296 voted last night to accept the Tentative Agreement for the 2012/2013 negotiations, according to an announcement by the Palmdale School District. The focus of the 2012-2013 negotiations has been to address the District’s multi-million dollar deficit created by state budget cuts. The District and CSEA were able to reach an agreement on salary reductions and furlough days for the 2013-14 and 2014-15 school years, along with the substantive restoration contingency language designed to restore first salary reductions and then furlough days to the full extent possible should, as both parties hope, there be funds available from unrestricted ending balances and/or unrestricted new monies over the next two years. The passing of the tentative agreement allows the District to rescind the layoff of 20% of the classified employees. The District has proposed that all employee groups accept the same cuts and a health benefits maximum contribution of $15,550 in order to maintain fiscal solvency. The District’s management team and CSEA have had the maximum contribution in place for several years now and have both agreed to the same salary reductions and furlough days over the next two years. At this time, the Palmdale Elementary Teachers Association has not agreed to the same salary reductions, furlough days and maximum contribution and is currently in factfinding. Currently, the majority of teachers in the district have unlimited health benefits. The Tentative Agreement will be presented to the Palmdale School District’s Board of Trustees for ratification at the next Board Meeting on June 18, 2013. 4 comments for "Classified staff and PSD reach tentative agreement"
So is this why my daughter’s last week of school was suddenly shortened from friday to wednesday? I didn’t really matter how the vote turned out…employees on both sides were getting screwed! Unlimited health benefits? Since when? All of us hired after 2006 have to contribute over 300 dollars a month to get decent benefits. The CSEA always goes first and in the end always gets the worst deal….. The CSEA does the same in the high school district….. CSEA is a union ran by mostly [removed] that always give in and then the rest of the district gets a better slice of the pie…..